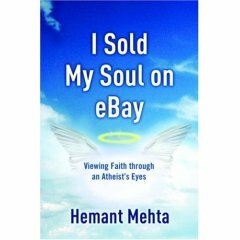 "I sold my soul on eBay: Viewing faith through an Atheist's eyes"
Amazon.com: When Hemant Mehta was a teenager he stopped believing in God, but he never lost his interest in religion. Mehta is 'the eBay atheist,' the nonbeliever who auctioned off the opportunity for the winning bidder to send him to church. The auction winner was Jim Henderson, a former pastor and author of Evangelism Without Additives. Since then, Mehta has visited a variety of church services�posting his insightful critiques on the Internet and spawning a positive, ongoing dialogue between atheists and believers. I Sold My Soul on eBay tells how and why Mehta became an atheist and features his latest church critiques, including descriptions of his visits to some of the best-known churches in the country. His observations will surprise and challenge you, revealing how the church comes across to those outside the faith. Who better than a nonbeliever to offer an eye-opening assessment of how the gospel is being presented�and the elements that enhance or detract from the presentation. Mehta announced prior to his churchgoing odyssey that he would watch for any signs of God�s existence. After spending Sunday mornings in some of the nation�s leading churches, what happened to the man who sold his soul on eBay? Did attending church change his lack of belief? The answers can be found inside.."
Mehta was raised in the Jain faith and lost his faith in God while he was a teenager. He is a leader in the Secular Student Alliance. Their mission "... is to organize, unite, educate, and serve students and student communities that promote the ideals of scientific and critical inquiry, democracy, secularism, and human based ethics." He visited fifteen churches in four states, including some of the best-known churches in the U.S. He wrote his impressions on how the churches sounded like, looked like and felt like to a curious and non-committed outsider. "Central to the life of a Christian is embracing the truth wherever you find it, living with the awareness that God can speak at any time, anywhere, through anyone." "This puts our friend Hemant in an unusual position. Lots of people in lots of churches will find this book very helpful in their efforts to put a face on God for the world we live in. So Hemant's work as an atheist will ultimately inspire people to live better lives in harmony with a God he doesn't believe in. It's beautiful, really." Title: "I sold my soul on eBay: Viewing faith through an Atheist's eyes"
Cost: List: U.S. $13.99. Amazon.com sells it for $11.19 plus postage, for a saving of 20%. You can ask Amazon.com for free but slower shipping on most orders of US $25.00 or more. "What Would Jesus Really Do? : The Power & Limits of Jesus' Moral Teachings"
Amazon.com: " 'What Would Jesus Really Do?' examines what Jesus says (and doesn't say) about complicated contemporary ethical issues including abortion, euthanasia, the death penalty, war, homosexuality, and the family." Peter Singer: "I hope this book will be widely read by Christians, especially those who believe that so-called Christian ethics really are base on the sayings of Jesus as presented in the New Testament. Paul Kurtz: "I avidly read this book in one sitting. It is a thoughtful and insightful appraisal of the ethics of Jesus in the light of contemporary humanism and rational inquiry." 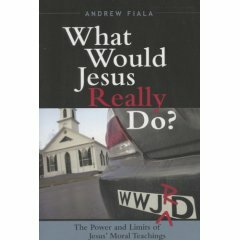 John Shelby Spong: "Andrew Fiala openly and powerfully faces the limits of the Bible when dealing with contemporary ethical issues. He asserts that respect for scripture does not require the literalization of time-oriented ancient texts, which we then apply to complex modern problems. The result is an exciting book designed to challenge traditionalists and modernists alike." There are many books, pamphlets, sermons, articles etc. that explain in great detail "What would Jesus do?" "WWJD" has appeared on pin, broaches, T-shirts, etc. In each case that we have studied, the author has suggested that she/he know exactly what Jesus would do in each ethical dilemma from abortion access, to equal rights for homosexuals, to physician assisted suicide etc. Unfortunately, their opinions seem to reflect their fundamentalist, other evangelical, Roman Catholic, mainline, or progressive Christian faith. The many books thus disagree about WWJD. This is the first book that admits that there are severe limitations when trying to translate the sayings and teachings of Jesus from the first century CE Judean culture -- as subjugated by an occupying Roman Army, and an oppressive religious system, with racism, human slavery, sexism, homophobia, xenophobia, etc. -- to today's western culture with its democratic government, personal freedoms, diminishing bigotry, and many social problems brought about by medical, social and natural sciences. The author concludes that we simply do not know WWJD in many cases. Many readers will probably agree. Title: "What Would Jesus Really Do? : The Power & Limits of Jesus' Moral Teachings"
Amazon customers' rating: None available yet. Cost: List: U.S. $19.95. Amazon.com sells it for $13.57 plus postage, for a saving of 32%. You can ask Amazon.com for free but slower shipping on most orders of US $25.00 or more. Kevin Jenning's memoir "Mama's Boy, Preacher's Son." "This rags-to-riches story, about growing up poor and eventually reaching Harvard has bite and pathos. The youngest son of a born-again Southern Baptist preacher originally from Massachusetts, and a mother from Appalachian Tennessee, Jennings led an itinerant youth among trailer parks in Southern towns where his dad would try to find work. The boy couldn't make his father proud on the football field, and already he had learned that "being a real man meant taking advantage of anyone smaller or weaker than you." With his father's abrupt death when Jennings was eight, he became a "mama's boy," introverted, brainy and overweight, and ridden by guilt at his incipient homosexuality. Supported by his scarcely educated mother, who became the first woman manager at McDonald's, Jennings excelled in school and on the debate team and was accepted to Harvard by 1981. Jennings became a high-school teacher, at Concord Academy among others, agonizing over the decision to out himself; he promoted the creation of GLSEN (Gay, Lesbian and Straight Education Network) to protect students from the kind of harassment he experienced firsthand. When his national crusade brought him back home to speak at the same Winston-Salem school system where his "young soul had almost been crushed," Jennings writes of his journey with graciousness and candor." "One might expect the life of a gay son of a Southern minister to be miserable and brief, but this one is truly inspirational, both because of the quality of the son, and of the extraordinary tenacity of his uneducated but street-smart mother. Jennings has a memory for and eye for detail that is astonishing. Anyone who believes that homosexuality is a 'lifestyle choice' should be convinced otherwise by this memoir, though some will be troubled by Jennings' brazen attitude during his Harvard years. My experience with teaching at a "private school" paralleled his -- not the place for a liberal-minded person with an independent streak. One has to admire the man Jennings became and appreciate the strength required to get there." "Not just another 'growing up gay' tale, this is a well-crafted mix of individual history and a testament to what can be achieved by dedicated people." "The author grew up in a typical Southern Baptist environment in the 1960's and 1970's. He was harassed and persecuted for not conforming to cultural norms throughout his youth. He quickly realized that there was no support or protection available from his family, peers, school officials, or other authority figures. Conversely, his mother was dedicated to ensuring he got the education she never had." "Mama's Boy, Preacher's Son reviews Jenning's slow journey through awareness of his difference, recognizing he was gay, and overcoming the self-hate thrust on him by his peers, his father and brothers, and bigoted authority figures. While an undergraduate at Harvard, he found personal acceptance and began his public advocacy." As a much-loved high school teacher and counselor, he publicly supported his gay and lesbian students. This led to founding a student group that included not only gays and lesbians, but straight allies as well. This was the first ever Gay Straight Alliance. "Word got out to other gay teachers and administrators, and Jennings was invited to speak to them about organizing GSA's in their schools to protect their gay and lesbian students. Shortly thereafter, he met another highly-supportive teacher who had started a gay-straight alliance in her school. Together they started working toward a more widespread support organization. Their goal was to help teachers and counselors everywhere teach awareness of the need for anti-harassment and anti discrimination protections at their schools. Subsequently, they banded together with several of their contacts to form the support network that became the Gay, Lesbian, Straight Education Network (GLSEN)." "Mama's Boy, Preacher's Son is a well-written, easy read. The book chronicles the stress of facing harassment and bigotry toward gays both as a student and as a teacher in a 'diversity-affirming' private school. It shows the courage of those who stand up for right and equality. Most of all, this book demonstrates the life-long impact of a mother's dedication to her young son's success." 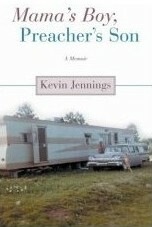 "Very few books I've read have touched me as deeply as Kevin Jenning's book 'Mama's Boy, Preacher's Son.' The author does an excellent job hooking the reader in with descriptions of life growing up in the South, with feelings of not being 'normal'." "From the depths of despair in a childhood gone wrong, Kevin managed to form an idea of how to change the climate in schools, and make them a better place for kids to learn. The things he went through as a student trying to get an education and putting up with bullying and harassment are amazing, and incredibly sad. This book should be required reading for teachers entering the field, so they understand why bullying and harassment isn't just 'kids being kids' and can cause significant and lasting damage to the victims." Title: "Mama's Boy, Preacher's Son: A Memoir of Becoming a Man "
Cost: List: U.S. $24.95. Amazon.com sells it for $16.47 plus postage, for a saving of 34%. You can ask Amazon .com for free but slower shipping on most orders of US $25.00 or more. "Spong, the iconoclastic former Episcopal bishop of Newark, details in this impassioned work both his 'deep commitment to Jesus of Nazareth' and his 'deep alienation from the traditional symbols' that surround Jesus. For Spong, scholarship on the Bible and a modern scientific worldview demonstrate that traditional teachings like the Trinity and prayer for divine intervention must be debunked as the mythological trappings of a primitive worldview. These are so much 'religion,' which was devised by our evolutionary forebears to head off existential anxiety in the face of death. What's left? The power of the 'Christ experience,' in which Jesus transcends tribal notions of the deity and reaches out to all people. Spong says Jesus had such great 'energy' and 'integrity' about him that his followers inflated to the point of describing him as a deity masquerading in human form; however, we can still get at the historical origin of these myths by returning to Jesus' humanity, especially his Jewishness. Spong so often suggests the backwardness and insecurity of those who disagree with him that his rhetoric borders on the fundamentalist. His own historical and theological reconstructions would be more palatable if he seemed more aware that he too is engaged in mythmaking." By Bruce Robinson, the webmaster of this website, submitted the following review to Amazon.com: customer with the title: "Seek the truth; come whence it may, cost what it will"
This title is the motto of the theological seminary that Bishop Spong attended. It would do well as a subtitle to this book. Spong was inspired to write this book by a comment of Deitrich Bonhoeffer. He called upon Christians to create a "religionless Christianity." Bonhoeffer was executed by the Nazis before he was able to develop the concept further. But Spong hopes "...to build on Bonhoeffer's idea and to find a way through the human Jesus, but beyond the confines of religion, that will lead me into all the I now believe the word 'God' means." Spong suggests that the Jesus of most modern Christian denominations is based on medieval doctrines which are rooted in pre-modern, pre-scientific "...assumptions that are no longer believable." To others, Jesus has become only a faded memory. 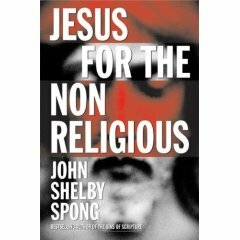 In this book, Spong cruises through the gospels, attempting to separate the human Jesus -- the itinerant Jewish rabbi who walked the hills of Galilee during the first century -- from myth and folklore. Spong treats the Christmas star, the Twelve Disciples, resurrection, ascension, etc as myths. Title: "Jesus for the Non-Religious"
Amazon customers' rating: The book was only released on FEB-27, so there are no ratings or reviewes available yet. "Good news for a change: How Everyday People are Helping the Planet,"
We figured that with all the devastating news about the environment, our visitors needed to learn of some positive efforts being made by individuals and small groups around the world. "The litany of environmental bad news � rapid extinction of species, pollution, depleted food sources � can be overwhelming, but there's hope too. 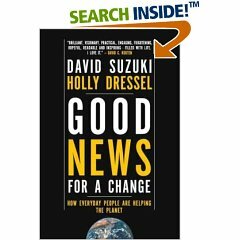 In this thoughtful look at what�s happening behind the grim headlines, authors David Suzuki and Holly Dressel show that thousands of individuals, groups, and businesses are already changing their ways. They highlight the growing number of profitable companies with a positive presence in their communities, activists and Third World villages practicing true participatory democracy, farmers and ranchers sharing their land with other species � even some governments, local and national, basing economic development on an eco-friendly model. The technologies needed to make a better world, say the authors, are already within reach � and being used. This practical, inspiring guide to saving the planet is based on the true stories of ordinary people who are doing it every day." "The collaborative effort of environmental scientist David Suzuki and writer/researcher Holly Dressel, Good News For A Change: How Everyday People Are Helping The Planet is an upbeat amalgamation of working solutions for the improvement human life while enhancing the quality of the environment. Successful plans to save species, conserve soil, and right social wrongs, range from keeping the ocean stocked with fish to preserving biodiversity among grasses and carnivores alike. Good News For A Change is a welcome and timely addition to Environmental Studies collections, as well as recommended for concerned environmental activists as being especially uplifting and inspirational reading." "This book will give you hope. It also will uncover the devastation on our planet, BUT with solutions that many are taking to change things for the better. You will learn many interesting and uplifting facts and enjoy being better informed in a way that gives a ray of hope." "David Suzuki has been a favorite environmentalist in Canada for years due in part to his marvelous TV program " The Nature of Things." Truly a person who is working with all his heart to improve the Planet he loves so dearly. It is a great book to give as a gift as well to those who would like some positive spin on environmental issues, while being informed on individuals that are making a difference for us all." Title: "Good News for a Change: How Everyday People are Helping the Planet." Amazon customers' rating: 4.5 out of 5! Most reviewers gave it 5 stars. One gave it three stars because they felt it was overly simplistic. ; those that didn't tended to give it one star -- but only because Amazon does not allow 0 stars. Another reviewer gave it four stars and a positive review. Cost: List: U.S. $16.95. Amazon.com sells it for $13.22 plus postage, for a saving of 22%. You can ask Amazon .com for free but slower shipping on most orders of US $25.00 or more. Books are often available cheaper -- new or used -- from Amazon's marketplace. You can buy it for less in new or used condition via Amazon marketplace. "Jesus: Uncovering the life, teachings and relevance of a religious revolutionary"
About "Jesus: Uncovering the life..."
"Almost two thousand years after his death, Jesus continues to be front-page news in the United States. Recent polls show that over 84 percent of Americans agree with the statement, "Jesus is the Son of God." From Mel Gibson's The Passion of the Christ to Dan Brown's The DaVinci Code to the mega-selling apocalyptic Left Behind series, we remain haunted by Jesus. " "Yet American Christians are deeply divided about what it means to follow him. Many followers of Jesus oppose evolution; many defend it. Some are among the strongest supporters of our nation's invasions and wars; others are among its strongest critics. Followers of Jesus can be found among the strongest opponents of gay-marriage, as well as among its strongest advocates." "Leading Bible scholar Marcus Borg takes us on an incredible journey to discover who Jesus was, what he taught, and why he still matters today. In the definitive book of his career, Borg argues that how we see Jesus affects how we see Christianity and reveals a new way of seeing�a new perspective that can overcome the differences between the literalists and progressives, a path that emphasizes following "the way" of Jesus, the original name of the Jesus movement." "Borg introduces us to a Jesus we have never really met before, a religious revolutionary who brought transformation, not doctrine. Jesus remains the decisive revelation of God, but we now encounter him as both a reality and a role model centered in God, focused on both personal and political transformation, emphasizing practices rather than beliefs, and exemplifying a faith characterized by deep commitment and gentle certitude." "In a time when Christians are deeply divided, Borg's magisterial work introduces a new conversation about Jesus, the person through whom we see clearly God's character and passion incarnate in a human life. For followers of Jesus, this is the conversation that matters most. You will be inspired." Title: "Jesus: Uncovering the life, teachings and relevance of a religious revolutionary"
Amazon customers' rating: 4.5 out of 5! People who liked the book tended to give it 5 stars; those that didn't tended to give it one star -- but only because Amazon does not allow 0 stars. Cost: List: U.S. $24.95. Amazon.com sells it for $16.47 plus postage, for a saving of 34%. You can ask Amazon .com for free but slower shipping on most orders of US $25.00 or more. Books are often available cheaper -- new or used -- from Amazon's marketplace.